The Stringer: Our First Fishing Report! 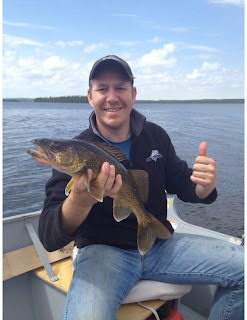 It's time for the first Lloyd Lake Lodge fishing report. Woohoo! 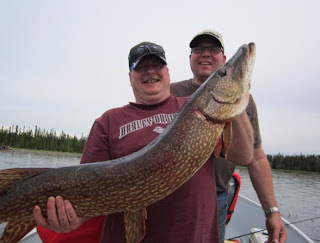 On Thursday, our fishermen launched a total assault on Lloyd Lake's walleye with one first-time angler purportedly catching 42 walleye before lunch, and then moving on to some great northern pike action. There were several walleye caught in the 3 to 4 pound range with the biggest weighing in at 4.4 pounds. Keep in mind that nearly every boat was fishing walleye, but even so, the biggest northern weighed in at 12.7 pounds. Even the owners get to catch a walleye every now and then. Derrick guided, and I landed this one as soon as my hook went in the water. Thanks bro, and thank you fish! Yesterday morning the water looked like glass with hardly a cloud in the sky; a perfect day for slamming fish. More walleye mayhem ensued. The largest was 5.6 pounds. As for northern pike, the anglers report unreal top water action. They landed two 20+ pound beauties and lots in between. One of yesterday's two huge northerns. Congrats Rod and Tony. Great fish! Today may be a day for lake trout. They’ll probably be heading to Big Fish Lake. In a couple of evenings of fishing for about an hour each time last weekend, we pulled in three 8+ pound lakers, and quite a few in the 3 to 4 pound range. We’ll see what stories our anglers bring home tonight. As for Arctic grayling, our first clients two weeks ago landed a few nice ones. In fact, one of the guys completed the Lloyd Lake grand slam (walleye, pike, lake trout, grayling). We haven't gone grayling fishing since, but we'll keep you posted when we do. Nice post. Thanks for sharing such helpful information.